The Great Conversation in Security has a very clear mission: To create personal, professional and organizational value in the risk, resilience and security industry. It starts with the customer experience: The leaders and their teams that assess the risk, understand their organization’s mission, and create the strategy, planning and performance metrics to mitigate risk and create value. It takes leadership, execution and technology to make that happen. The Great Conversation is not an event. It is a collective; a congress of best practices that are evolving with the times. Throughout the year we attempt to have as many conversations as we can with the ecosystem, studying their transactions of value, their constraints and the emerging threats that are creating their sense of urgency. We would like to provide a short summary of this year’s congress. We hope this will help the executives and their teams anchor their thoughts and inspire their actions. Which align with the educational tracks that form the backbone of the conversation. Your Security Program is a Business Model and it is being disrupted. This hit home with many executives since it painted a picture of a rapidly changing landscape that challenges our current notions of how we organize people within roles in our core processes using technology. It also challenges our definition of our value and promises a bright opportunity for those who can adapt and change. An industry panel that included two former CSOs, a current CSO and a Risk Management Services Organization, provided a global perspective of leadership and a response to the shifting landscape that was articulated in the opening keynote. That is, it was a grounding experience to hear how these executives were “re-balancing” their leadership competency and capability to respond to change. The Uberization of Security: Customer Experience, complexity and cost drive disruption – where is this hidden cost? This was a riveting step by step story of a small university that had prepared their people and their culture for an incident. As well, they had created a technology infrastructure and process that most larger companies have never achieved. The result: saving lives, creating resilience and, most importantly, anchoring the trust in the process they had spent years developing, training and measuring. GoDaddy’s security executive and LenelS2’s CTO worked together to provide insights into how to construct an information management platform and how we might think about the roadmap over the months ahead. A Security Executive from a high-profile airport provided his insights into the highly leveraged implementation of video for operational performance and for risk mitigation. It was followed by an educational primer on how executives can begin to evolve their video management platform into a service architecture to streamline operational, budget and risk performance. A Security Executive provided a roadmap on how to construct a Security Operations Center that can provide situation awareness and actionable intelligence and can trigger multi-modal (voice, public address, text, digital signage and desktop alerts) with a push of a button. It was followed by a roadmap on the age of voice and how to create intelligent outcomes through intelligent communications. This was a strong reminder that culture will be the key to long term success in our security and safety program. The ability to get great results, the ability to repeat great results, the ability to gain insights into what led to those results will be impacted by the cultural mindset leaders establish around continuous improvement. An Excellence Evolution Model was broken down into discrete elements that provided a roadmap to best practices in security, safety and leadership. 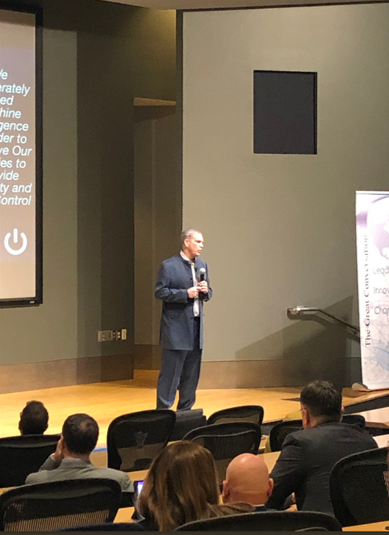 Our academic partner, the University of Washington, provided a thought leader in disrupting how we prepare our next generation knowledge workers and leaders for the changing landscape of risk. It stimulated a lively discussion around how to get started and created valuable touch points from the entire ecosystem. The executive leader of security described the venue and the challenge, and his trusted partner described the unique security technology infrastructure that keeps the attendees, the players and the media safe. A Case Study on the Power of a Cloud Managed Security Solution at Gonzaga University. The security leader described the risk and the opportunity and the trusted advisor the deployment with a focus on the evolution to a cloud-based video management architecture. This study featured the trusted advisor and the manufacturer, that illuminated the force multiplier of a high definition video camera implementation. Smart Company, Smart Building: Security’s Value Proposition is Changing. A CIO of a major hospital is leveraging domain expertise in physical security to leverage and augment his smart hospital vision and mission. The stakes are high. The customer experience and the mitigation of risk will dictate the performance measures of one of the best brands in the industry. A building that was designed from the ground up to be intelligent was the subject of a case study that detailed phenomenal metrics for security, safety and competitive advantage. The cost savings were also compelling. What I heard over and over as we networked over a hosted bar and appetizers, is how intense but productive the conversation was, with many of the new attendees essentially admitting they “had no idea how important and valuable this was”. Many also acknowledged the insights we have after 16 years of facilitating these conversations. One of the insights was when our emcee, Ron Worman, noted that in 2003, there were no women in the audience. He asked for all the women to stand and be recognized to the applause of the industry stakeholders in the room. We are now headed to Plano, Texas on May 21. Urge your peers to lend their voice to leadership, innovation and change by attending. Then we are headed to Washington DC for the Executive Summit Series, an invitation only leadership forum held during OSAC week. The date is Monday, November 18 at The Boeing Company in Crystal City. It is a great launching point for OSAC and the other associations holding events that week.